One math trade, I scored a pair of Call of Cthulhu starter decks, which sent me down a path to the living card game incarnation, which I’m still enjoying today. So I’m always hopeful that I’ll stumble on some unregarded gem that I wind up really enjoying. Most of what I have to offer in the trade are role-playing books. I can’t recall if I’ve ever successfully swapped any of them, but I’ll keep making them available. This year, I’m also going to take a hard look at the card and board games on my shelves, and figure out what I’m likely never going to play again. That number is probably going to be higher than I want to admit. Role Playing Public Radio boasts an embarrassment of riches from GenCon this year. In addition to their own wrap-up episode, where you can see the very impressive banner that called listeners to the meetup, they captured Diversity in Gaming from the staff of Paizo and the Campaign Doctors. I’m looking forward to hearing Luke Crane vehemently disagree with almost everything Caleb says. And because that’s not enough, host of RPPR Ross Payton produces Unspeakable!, where you will find two GenCon panels on Delta Green. I particularly dug “Lovecraft Meets Tradecraft,” which was half Q&A and half reminiscing among the Delta Green luminaries Glancy, Stolze, Detwiller, Ivey and Hite. I am utterly perplexed by this one. There are plenty of convention games I’ve enjoyed a lot. One session in particular I’m holding onto for day 17. I cannot, regretfully, pull one particular game as my favorite. I’ve run plenty of games at conventions, and never been especially happy with any of them, though the players certainly had fun, such as Band on the Run, in which the Pratchettian tooth fairy took to his appointed task with a glee and reckless abandon that took me totally by surprise, because obviously I did not think “a player is given a character whose motivation is to steal teeth” through to a full conclusion. There’s the Vampire: the Masquerade game that Gaylord ran at Carnage that I totally did not expect to enjoy, having an instinct bias against Vampire and yet enjoyed immensely, in part because I was playing with some friends and in part because we banded together instinctively and righteously against a player who’d decided to turn the session into a player-vs-player massacre. It was also my first effort at doing some physical mannerisms and a voice for my Nosferatu Jakob. It will not surprise anyone that maintaining an Orlok-like hunch for four hours is more than your typical squeaky, round-shouldered nerd can pull off. The highlight of OGC for me was always John Terra’s games. His Call of Cthulhu games are always a great mix of humor, horror, storytelling and a good play experience. He does a damn fine Paranoia, too. Having spent days dwelling on this question, I feel no closer to answering it effectively than when I began. I’m going to have to call this good, so we can all move on to the next big thing, whether that’s an #RPGaDAY prompt or convention game. 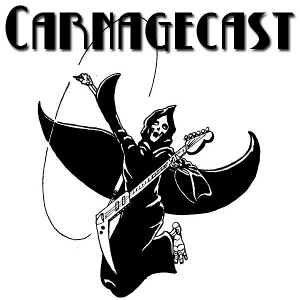 There’s a new episode of Carnagecast up over on the Carnage site. This week, James Carpio of Chapter 13 Press and more recently games editor of Gygax magazine joins us to talk about putting together a role-playing periodical in the modern age. Plus he’s just back from Gary Con and rather jazzed by all that he got to see and do there.